Please Note- The Friday Reunion Reception and Saturday Celebration Dinner will be combined this year. The event will be held outside at the Palm D'or Pavillion. There are no scheduled activities Saturday evening. Someone in the United States develops Alzheimer's every 66 seconds. Today, 5.4 million Americans are living with Alzheimer's Disease, including an estimated 200,000 under the age of 65. Among all people living with Alzheimer's disease, only about half have been diagnosed. Among the top 10 leading causes of death in America, Alzheimer's is the only disease that cannot be prevented, cured, or even slowed. The Spike Dykes Charity Fund was founded in honor of Sharon Dykes, who passed away in 2010 after a long battle with Alzheimer's Disease. 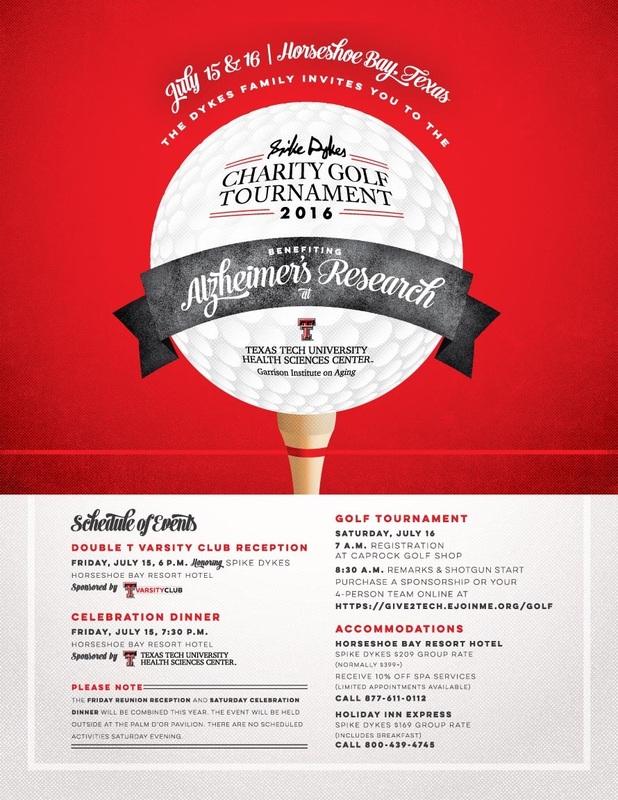 Since it's creation in 2012, the Spike Dykes Charity Fund has invested over $265,000 to support Alzheimer's research thanks to the success of the Charity Golf Tournament.